Everyone adores Appetizers! 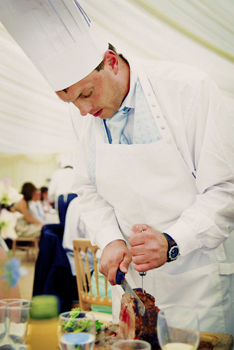 Our executive chef has created menus with you the host in mind. A variety of passed hors devours, chef attended carving stations, chilled stations and buffet menus are offered giving you the ultimate choice to customize your menus to perfection. Seated in decorative designer pumpernickel boat complimented by a variety of breads, tortilla chips & pita for dipping. 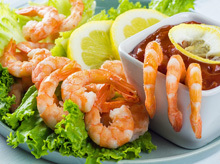 Jumbo shrimp seated on a blanket of romaine lettuce, complemented by carved lemon and Chef Joseph's zesty cocktail sauce. Price includes 125 units. beef, finished w/dollop of Horseradish Pepper Sauce, garnished with red onion. Served chilled. rye slices. Garnished with dill, red onion, capers. Served chilled. Glossy 7" appetizer plates, utensils, Cocktail napkins, chafers, decorative platters, bowls, risers. Onsite Waitperson(s): setup, replenish items when needed, guest services, station teardown. We have designed two popular options for your consideration. a fun, festive and social atmosphere to your special event. Scroll down to review what is included with service, minimum guests for published pricing and additional fees that you may incur. Fresh Buffalo Mozzarella with Roasted Red Pepper Empanadas with Marinara sauce. Gruyere, Sharp Cheddar, Velveeta with Cavatappi pasta. Sprinkled with buttery crumb topping and baked til golden. Palm size pasty pocket filled with spicy chicken and vegetables. Fire roasted salsa and Chipotle cream. Choice of 2 sauces; Tangy BBQ ,BBQ Bleu Cheese, Buffalo, Sweet Teriyaki Glaze, Louisiana Cajun. Between the flavorful sauce, colorful crunchy slaw & Hawaiian sweet buns, these lil' darling's demand attention from your party-goers! Tomato & Romaine accompany. Two styles included: Deep dish w/Pepperoni, Mozzarella, Basil in a sundried tomato in Chive tart shell. Deep dish w/Mushroom or Mozzarella & Parmesan cheese. Slow cooked pulled pork with fresh garnishes: Pico De Gallo, carved lime, red onion, guacamole, fresh chopped cilantro leaves. Choice of corn or flour tortillas. Kentucky Bourbon Sauce or classic Tangy BBQ sauce. 100% all beef mini hot dogs topped with mustard & sauerkraut and then hand rolled in phyllo. Traditional New York flavor! A perfect blend of lean corned beef, sauerkraut and Swiss cheese layered in a flaky rye pastry puff. Thousand Island dressing on the side..
A velvety smooth custard with Swiss cheese, cream and a touch of bacon in a pastry shell. Fire-roasted vegetables, fresh asparagus, spinach pesto and a rosette of goat cheese create a dramatic splash of color for this fresh and vibrant hors d'oeuvre. Colby jack, Gruyere, Sharp cheddar, Velveeta, Cavatappi pasta. Finished with buttery crumb topping and baked til golden. Addition of Crumbled Apple Wood Smoked Bacon upon request. Presented in individual vintage mini tin shells. Juicy chicken marinated in a traditional medley of Mediterranean flavors including olives, white wine & lemon with figs, roasted tomato. 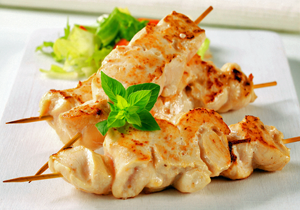 Chicken tenderloins marinated in a delicious blend of fresh peanuts and Thai Spices. Tender chicken breast pieces and mushrooms seasoned and marinated in a Marsala wine sauce wrapped in flaky puff pastry crescent. Shredded roast pork & smoked ham, natural swiss with pickles on petite bun or grilled flat bread. Delicious, marinated Steak w/fresh Cilantro, shredded lettuce, carved lime. Pico de gallo. Choice of: Party size corn or flour shells. 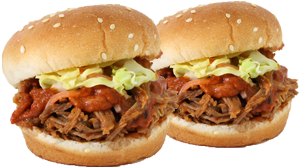 Full flavored, deliciously slow roasted, presented on mini gourmet Brioche buns and colorful crunchy slaw. Tender sautéed pork medallions, tangy Horseradish-Cheddar cheese, crispy onion tanglers and fresh watercress. Honey-Dijon Barbecue sauce and Bavarian mini pretzel buns. Includes sweet potato chips and waffle fries. Thinly sliced Sirloin presented with cheddar, horseradish mayo, lettuce leaf, fresh tomatoes. Pickles, relish, diced onion, Detroit coney sauce, ketchup & mustard. Lamb mixed with mild curry and spices, and raisins for a touch of sweetness. 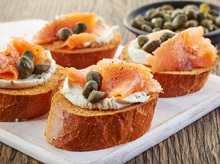 Capers, cream cheese, lemon dill sauce, mini garlic toast. Seated on a blanket of romaine lettuce, complemented by carved lemon and zesty cocktail sauce. Please inquire if you are interested in this service enhancement. Fresh "Free Range" Breast slow roasted w/fresh herbs. Specially marinated for twenty-four hours, then slow roasted in it's natural juices. Presented with sauté mushrooms, scored petite French rolls, gourmet mustard and creamy horseradish sauce. If you wish to add a Carving Station to $15.95 Appetizer Presentation + $2 per person to above prices. 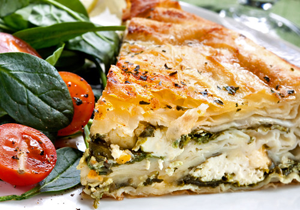 Their goal is to ensure that your Appetizer Reception is perfect! 2 hour service included in published pricing. Additional 1/2hr blocks of service available for $100 ea. Up to 4hrs. If you event falls below our published minimums; additional per person fees will be assessed. Ask about available discounts when you book your Appetizer Package that includes Bar & Dessert Stations! Consuming raw or under cooked meats, poultry, seafood, shellfish, or eggs may increase your risk of food borne illness, especially if you have a medical condition. *Asterisked items are served raw, or under cooked; contain or may contain ray our under cooked ingredients; or may be requested under cooked; or can be cooked to order. Metro Detroit, MI, Lansing, Flint, Jackson, Brighton, Troy, Rochester Hills, Hartland, Howell, Brighton, Saline. Lansing, Milford, Ann Arbor, Michigan, Monroe, MI and all counties in Southeastern Michigan. West Bloomfield, Michigan Corporate Caterer, Office Party Catering, Bloomfield Hills, MI Corporate Caterers, Wixom, Novi, MI Corporate Catering Services, Livonia, Canton Office Party Catering, MI Business Catering Services, Westland, Wayne, Detroit, Dearborn, Dearborn Heights, Michigan, Wyandotte, Auburn Hills, MI Troy, MI Corporate Caterers, South Lyon, Milford, Plymouth Business Catering Services, Northville, MI, Ypsilanti, Redford, Farmington Hills Office Party Catering, Canton, MI Corporate Dinner Caterers, Commerce, Royal Oak, Michigan, Birmingham, Upscale Restaurant Quality Catering in Farmington, Michigan, Ann Arbor Corporate Event Catering Services, Dexter, Pinckney, Brighton, MI Corporate Meeting Catering Service, Howell, Hartland, Fenton, MI, Flint, Southfield Corporate Catering Services, Belleville, Rochester Corporate Reception Caterers, Michigan, Ferndale, Rochester Hills, Gourmet Bloomfield Hills Corporate Catering Services, Clarkston, Waterford, Bingham Farms, MI, Taylor, Saline, Brighton Business Party/Reception Caterers, Lapeer, MI, Sterling Heights Office Party Caterers, Warren, St. Clair Shores, MI, Eastpointe, Harper Woods, Grosse Pointe Office Party Catering Services, Grosse Pointe Farms, Roseville, Clinton Township, MI Corporate Catering Service, Shelby Township, Beverly Hills, Trenton, Downriver, Jackson, Lansing, MI Corporate Catering, Michigan, Metro Detroit Corporate Catering Services, Oakland County, MI Corporate/Business Catering Service, Wayne, Macomb, Livingston County, MI Business Catering Services, Washtenaw, Genesee, St. Clair, and Ingham County. 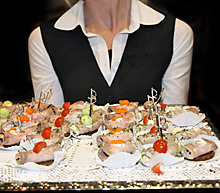 Corporate Conference Caterers, Business Meeting Catering Services, Michigan Local Affordable Office Catering, Holiday, Christmas Office Party Catering.